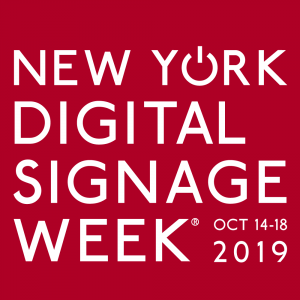 New York Digital Signage Week takes place Monday October 14 to Friday October 18, 2019. Once again the week will be the usual heady mix of FREE and PAID for events – conferences, showcases, cocktails, open house, breakfast debates, tours and other ad-hoc activities. ‘Lunch With Samsung’ will once again kick off the week at midday on Monday, the DPAA Video Everywhere Summit will be held on Tuesday October 15 at the Sheraton hotel in midtown Manhattan, AdExchanger’s two day PROGRAMMATIC I/O event will take place October 15-16, 2019, the DailyDOOH Investor Conference will take place on Wednesday October 16 and AdTECH: OOH – New York will take place at the World Trade Center on Thursday October 17, 2019. If that wasn’t enough, then another thirty or so events will be scheduled by others that week as well (Last year 32 events took place and 108 speakers and 4,600 attendees participated in New York Digital Signage Week). The suggested hashtag for the week is #NYDSW. To help people put on their own events, we’ve created ‘Your Guide To Creating a Pop-Up Event During New York Digital Signage Week’. Email Russcurry@gmail.com if you want a copy, which explains how easy and beneficial doing something during the week can be.